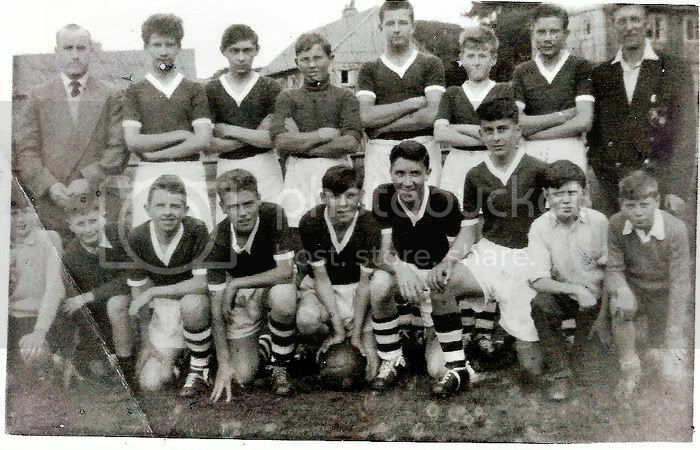 Received this photo by e-mail from Iain McKerral who was given this photo by Billy Bruce showing Kinloch Boys Football Club. The photo was taken some time between 1954 and 1956 but perhaps someone knows exactly when? I do believe that is a young Alex McKinven third from the right at the back? So you did play football after all Alex. Do you or anyone else have any information on the photo or the club itself? Thanks for sending this Iain - if anyone else has any photos they wish to share please send to dml@campbeltown.info with any detail you have. The picture is 1958. Don't make us older than we really are! There were four teams in the older boys age group of the Miners Welfare Boys League - Glenside, Kintyre, Dalintober and Dalriada. The picture you have here is Kintyre FC not Kinloch.